Following the immensely successful launch of its Young Entrepreneurs Development program last year, Colombo Leadership Academy (CLA) is hard at work grooming the latest generation of young entrepreneurs in Sri Lanka. The island’s premier leadership coaching and executive education facility has already been able to nurture and inspire a diverse spectrum of young entrepreneurs to take the reins on their own business ideas and refine novel, innovative business concepts into powerful and practical business models capable of thriving in real market places. “Overall I feel that the Young Entrepreneur program has really helped me to develop a long-term strategy and vision for my business. I’d definitely recommend this program to any young entrepreneurs looking to embark on their own business venture. 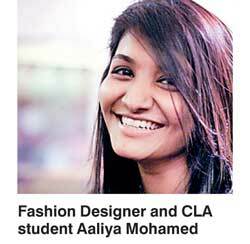 Participating in this program gave me the sense of motivation and direction that I needed to achieve my dreams and I’m confident that the program can do the same for others,” Fashion Designer and CLA student Aaliya Mohamed said. Developed by the CLA with a view to growing the inherent strengths of an entrepreneur among Sri Lanka’s next generation of business leaders – including an emphasis on problem-solving skills, analytical ability and unconventional approaches to branding and marketing – the Young Entrepreneur development program has been carefully crafted module-by-module in order to bring out the best in its students and rapidly hone their ability to successfully identify and build on a given business opportunity. The program provides comprehensive training in: business idea generation, market analysis, business incubation, business model development, prototype development and simulation, creating brand value and innovation, intellectual property and legal, leadership and HR, and market strategies. Furthermore CLA also provides support to its students to gather startup capital and post-program mentorship by experienced entrepreneurs to shape their business journeys. In this manner, CLA aims to gradually contribute towards the creation and expansion of a vibrant start-up culture locally which in turn will open up unprecedented new opportunities for Sri Lankan’s from all walks of life to empower themselves while striking an easier balance between their personal and professional lives. Be sure to be a part of CLA’s next intake to experience an inspiring and empowering Entrepreneurship program and dare to create your own success story. For more details visit cmbleadershipacademy.com, E-mail claprograms@cmbleadershipacademy.com, or telephone 072 0865000 and 072 0865001.